The players with the dignitaries after the Badminton Championship. Arunachal Pradesh’s ace shuttler Laa Talar retained his number one ranking for the sixth consecutive year as he was once again crowed the men’s singles champion of the 6th edition of Dorjee Khandu Memorial State Badminton Championship-2018, which came to a successful end here at the Late Kalikho Pul Stadium on Thursday evening. Talar maintained his ranking by defeating his closest rival Akshay Raito in straight sets of 21-13 and 21-12. A similar story was repeated in the women’s singles as top ranked Pinky Karki got the better of number 2 seed Laa Yajum to retain the number one spot and clinch gold. The rivalry, that to three sets eventually saw Pinky emerge as the better player as she despite losing the first set came back strong in the last two and won it 17-21, 21-11 and 21-18. The mixed doubles contest saw top-seeded pair of Taniya Yasap and Rahul Thapa march past the un-seeded pair of Irani Sonowal and David Ngomle in the finals. Though Irani and David put a tough fight in the first set and stretched the match all the way down to the wire, they could not repeat the same in the second and eventually lost it 21-19, 21-14. A tough fight was up in the offing in the U-13 girls’ singles final as number 3 seed Montilly Pul was up against number Taku Neha who presently holds the number 4 ranking in state in the category. Montilly who looked in complete control of the match from the beginning eased past Neha in the first set with a score of 21-13. Unmoved by the loss, Neha, however, came back strong in the second set and won it 15-21. The final set saw Montilly put up a brilliant show in the latter half of the match and win it 21-17. 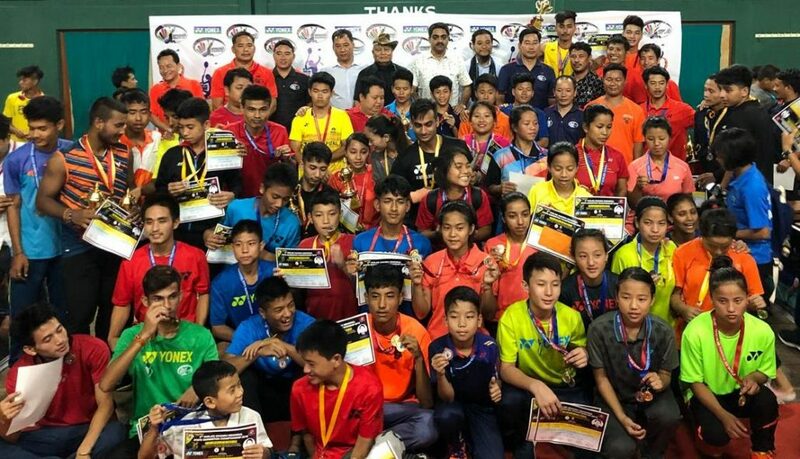 The U-13 boys’ doubles final witnessed Lobsang Chouidup and Suraj Chetry of Tawang clinch the gold medal as they defeated the pair of Nima Dorjee and Pakli Bagra in sets of 21-12, 19-21 21-16. The U-17 boys doubles final on the other hand saw the pair of Kirto Nyorak and Raj Thapa withstand little resistance en route to a 21-16 21-15 against Dekam Yomgam and Megi Riram. The number one seeded pair controlled the rhythm throughout the match and savoured their win in a comfortable manner. The men’s doubles (open category) saw the top seeded pair of Laa Talar and Jokom Rebia bow down to Biki Lakhai and Akshay Raito in the finals. The match which unexpectedly turned out to be a once sided affair saw Biki and Akshay walk home with gold as they defeated Talar and Rebia 21-14, 21-14. The women’s doubles crown once again went to the pair of Pinky Karki and Taring Yania as they thrashed Laa Yajum and Apali Mega in straight sets of 21-8 and 21-9. Yumlap Mopi defeated Kapu Rumi to regain her number one rank in the U-19 girls final. Badminton Association of India (BAI) secretary (Events) Omar Rashid, who graced the finals of the tournament as chief guest lauded Arunachal State Badminton Association (ASBA) and Lohit District Badminton Association (LDBA) for successfully hosting the state coveted Badminton event away from the Capital for the first time. Omar said Badminton is slowly and gradually becoming one of the most popular sports in after cricket as the Indian shuttlers have been dominating the game in the world stage. “Arunachal has great potential of producing world class players provided that good training infrastructure and training is provided to them,” the secretary said. Earlier in his welcome address, Sports and Youth Affairs minister on Dr Mohesh Chai said that the presence of Omar would greatly motivate the budding talents.